India over the last year or so has seen a flurry of interesting developments in the technology, media and telecommunications space that has made it difficult for the rest of the world to ignore. The Indian Government and regulators have been proactive in keeping up with technological advancements and coming up with new rules and regulations. 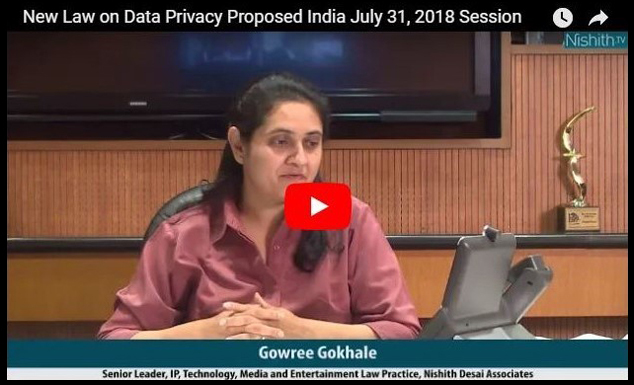 They span from the headline-making proposed general data protection law that has flavors of the GDPR as well as the upcoming California Consumer Privacy Act of 2018, to the developments on net neutrality, digital payments and crypto-currencies, e-commerce, online content regulation and a host of disruptive technologies. Interestingly, the proposed data protection law also has extra-territorial jurisdiction to foreign companies with a nexus to India. With that in focus, we will discuss how these developments affect companies, ranging from a small start-up to a multi-national corporation, doing or looking to do business in India in the Technology-Media-Telecom space. Nishith Desai Associates (NDA) is a research based international law firm with offices in Mumbai, Bangalore, Silicon Valley, Singapore, Mumbai-BKC, New Delhi, Munich and New York. It specializes in strategic legal, regulatory and tax advice coupled with industry expertise in an integrated manner. Our core practice areas include International Tax, Succession and Estate Planning, International Tax Litigation, Mergers & Acquisitions, JVs & Restructuring, International Litigation & Dispute Resolution, Capital Markets, Corporate & Securities Law, Fund Formation, PE/VC Fund Investments, Real Estate Fund Formation, Real Estate Investments, Employment and HR, Intellectual Property, Competition Law, International Commercial Law. Our specialized industry niches include financial services, IT and telecom, education, pharma and life sciences, media and entertainment, real estate and infrastructure.